Step 1 Place oats in a food processor; pulse 4 or 5 times. Combine oats, flour, coconut, bee pollen, matcha powder, baking powder, baking soda, and salt in a bowl. Step 2 Beat sugar and butter with an electric mixer on medium speed in a large bowl until light and fluffy, about 3 minutes. Add egg; beat until incorporated, about 2 minutes. Beat in vanilla. Add oat mixture; beat on low speed until well combined. Step 3 Scrape dough (it will be sticky) onto a 16-inchlong piece of parchment. With damp hands, shape dough into a 9-by-2- inch log. Wrap log in parchment ; twist ends to seal . Chill for 2 hours. Step 4 Preheat oven to 350°F. Using a sawing motion, cut log into 24 3/8-inch-thick slices. Place slices 2 inches apart on parchment-lined baking sheets. Bake until lightly browned, about 11 minutes. Let cool on baking sheets on wire racks for 5 minutes. Transfer to wire racks to cool completely, about 20 minutes. These cookies likely contain less sugar than the matcha pastries you see in cafés, and more nutrient-boosting ingredients. What’s more, the recipe is easy to make, and produces a yummy snack to satisfy sweet cravings. 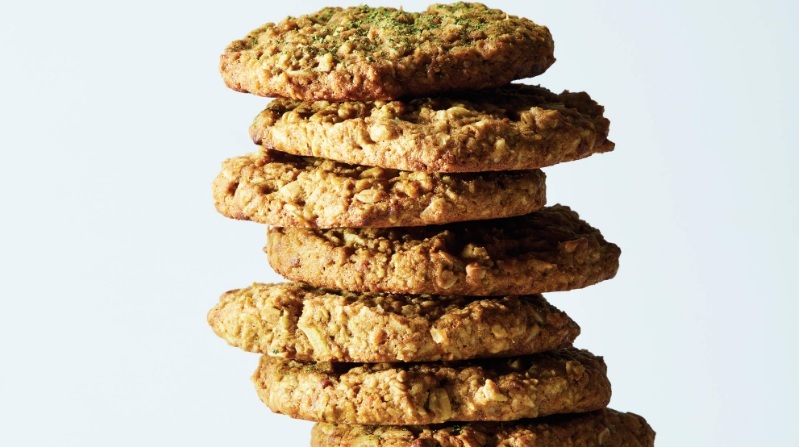 Warning: After trying these cookies, you may want to add matcha powder to everything.